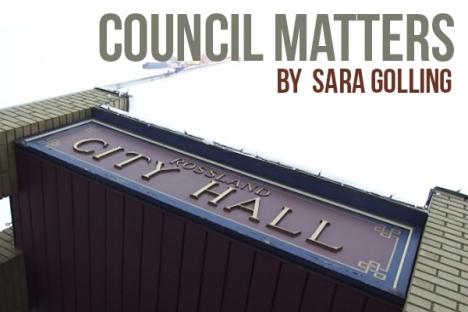 Editor’s Note: These reports on Rossland City Council meetings are intended to be as complete and as neutral as reasonably possible, so that residents can track Council’s decisions and also better understand what the job of Council entails. Present: Mayor Kathy Moore, and Councillors Chris Bowman, Andy Morel, Dirk Lewis, Janice Nightingale, Scott Forsythe. Absent: Stewart Spooner, off in Australia to renew his charming Oz accent. Laura Petit commented that the 413-page Council agenda package was “a ridiculous length,” and raised the issue of parking obstructing the lane between Seven Summits Coffee and the residence across the lane on Columbia. Richard and Deanne Soltice spoke about the streetlight outside their home on McLeod Avenue; they had submitted a comment. They don’t like the way the light from the streetlight invades their home, particularly the bedrooms, and would like the light moved. They are also upset that service to a new lot with underground service led to Fortis erecting the pole on the City boulevard near their home, with a transformer and more wires obstructing their view, and because of the new wires, Fortis also severely trimmed a maple tree on their property that they planted 25 years ago; Soltice wants the City to pay for an arborist to re-shape the tree. The City used that pole for the new streetlight, as its position provides more even lighting and improves safety along McLeod Avenue. Fortis always checks with the City before erecting a new pole, to ensure that the necessary digging will not disrupt any City infrastructure, and the City gave the go-ahead. Soltice thinks he should have been consulted first, as the pole, transformer and wires are unwelcome additions to their viewscape. Bill Profili offered to answer questions about the Esling Park Lodge mortgage agenda item. Moore asked if they had considered a second mortgage, and Profili responded that it would save time and complications to extend the arrangement with the city instead. Derek Wolfe, Rossland’s Community Paramedic, presented to Council on the BC Emergency Health Services Community Paramedicine Initiative. Rossland is one of the fortunate “rural” communities to be assigned a community paramedic. Wolfe spoke of the different role of community paramedics in monitoring people with chronic disease and keeping them from having emergencies, so they can live in their homes as long as possible. He referred to a video (it can be found at the link – just scroll down) from BC Health Services. Wolfe has a “patient load” of 10 or 12 people for home health monitoring whom he attends to for two days a week; for three days a week he is on call for 911. 2. The benefits of having an Asset Management Plan (and what it means): We should all know this. Cory Sivell of Urban Systems (consultant for the City) provided Council with an update on Rossland’s Asset Management Investment Plan. Communities must have an Asset Management Plan to be eligible for grants and Gas Tax funds, and municipalities are embracing the concept with a will. Having a plan means listing all municipal assets – infrastructure such as water and sewer pipes, buildings, roads, and so on – and tracking how much estimated “useful life” remains in each, and what maintenance will likely be required at what times, and now much it will cost, and how much money the municipality should be collecting and setting aside in reserve funds to ensure timely replacement or repairs when needed – without incurring excessive debt. Sivell explained that having an “infrastructure deficit” is not a bad thing, as long as it doesn’t represent a large percentage of the municipal assets. A modest “deficit” may just mean that the community is getting more life from an asset than originally expected. Too large a deficit means that too many of the municipality’s assets could potentially fail and require costly replacement in the near future, and that the municipality is not financially well-enough prepared for that eventuality. Using charts, Sivell demonstrated that very small adjustments in municipal finances can have large effects in a few years. Why have municipalities allowed large infrastructure deficits to build up? They felt under enormous pressure to keep property taxes low, so failed to tax at a rate that would enable them to build up reserves to handle replacement of things like water systems and sewage pipes and treatment plants. They “borrowed from the future” -- which works only until the future arrives. And for many, it has already arrived in the form of an urgent need to replace quite a lot of infrastructure. Hence projects such as the Columbia Avenue project, the Washington Street project, and the Spokane Street/LeRoi Avenue project, all of which dug up streets to replace over-aged, under-performing buried infrastructure. a) Development Variance Permit Application – 765 Redstone Drive: a motion to allow a reduced front setback, from 4 meters to three meters, to build a new garage with a suite above, CARRIED unanimously with no discussion. b) Development Variance Permit Application – 2142 Third Avenue: the owner seeks variances to allow a current dilapidated porch to be replaced with a mud room, and an addition to be built at the back of the home; the variances would match the non-conforming current structure. A motion to approve the application CARRIED unanimously, again with no discussion. c) Streetlight Policy – Feedback and Requests from Citizens: McLeod streetlight #284. Manager of Public Works Albo commented that he has a problem with moving the light back to its original position, for reasons of safety. Teasdale commented that the light was moved according to City policy to improve safety. Forsythe commented that he thought the light outside the Soltice house doesn’t comply with policy, but Moore disagreed -- there are always trade-offs. Nightingale moved that the City investigate the possibility of moving the light diagonally and across the street. The motion CARRIED unanimously. Light #47 behind Misty Mountain Pizza: Nightingale moved that light #47 stay; the motion CARRIED unanimously. Light #69 on Davis Street, just above 3rd Avenue: Morel moved that the light stay, and that if it would help to turn the light 90 degrees, to do that. Bowman asked whether there is any additional shield that could be added to lights beyond the interior shields; the answer was no. The motion to keep Light # 69 CARRIED unanimously. Light # 245, a mid-block light on Butte Street: Lewis moved that it be removed; the motion CARRIED. Light #304, at Davis Street at the base of the foot/bike path to Nickelplate; a motion to leave the light in place CARRIED unanimously. d) UBCM Stream 2 Age‐Friendly Grant Application: a motion to apply for a grant of $15,000 to hire a co-ordinator for an age-friendly program CARRIED unanimously. e) Rekindle the Spirit of Christmas Event Support Request: this event is now being run by the Trail and District Chamber of Commerce, with the support of downtown merchants and other member businesses in Rossland. A motion approving the required staff time and equipment CARRIED unanimously. f) MODUS Final Report on recreation, and Grant Opportunities: the report (available on the City’s website as part of the November 26 agenda package) details and summarizes responses to the recreation surveys, which had a good rate of response. Rosslanders value their trails system above all other public recreation facilities, followed by the arena, the Miners Hall, the Rossland Public Library and the Rossland Pool. Most Rosslanders expressed comfort with tax increases of 0% to 3% for recreational facilities. Nightingale expressed disappointment; Moore noted that the MODUS report was a first step, the City is new at asset management planning, and she hopes that we will not find ourselves in this position again. CAO Bryan Teasdale expanded on the fact that the City is not ready yet to pursue these grants; Moore suggested that Council have a Committee-of-the-whole (CoW) meeting on the issue; Teasdale suggested that the CoW would be most useful closer to Strategic Planning time. A motion to have a CoW meeting scheduled to discuss the MODUS report CARRIED. g) Rossland Seniors Housing Society Request for Mortgage Renewal. The Society operates Esling Park Lodge; the City holds a mortgage over the Society’s leasehold interest securing a loan of $270,000, currently at 2.5% interest. The Society has been paying only interest, not principal, and the full principal becomes due on January 1, 2019. The Society’s proposal is to discharge the current mortgage and replace it with a new one at 3% interest, which will mature on February 1, 2021. The Society pays all utilities and property taxes with no exemptions or waivers. The Society suggested that it would pay 50% of the legal fees for the transaction. A motion to renew the mortgage at 3% interest, and the City paying 50% of the legal fees as requested FAILED unanimously. Nightingale moved that staff create a more competitive mortgage by charging 4.65% interest, with the Society paying the full legal fees, and paying down the principal as if it were amortized over 25 years. She feels that the City needs to ensure that the Society isn`t motivated to keep returning to the City for this financing. Lewis commented that he doesn`t want to bankrupt the society, and the motion FAILED unanimously. Bowman moved that the Society pay the same rate as charged by BC Housing, pay no principal, and pay full legal costs; and pay the full principal back on February 1, 2021. The motion CARRIED unanimously. h) RDKB/City of Rossland Sole Benefitting Asset Transfer for previous Regional Sewer Utility Infrastructure: a motion to implement the transfer to Rossland, for $1, of ownership and responsibility for maintaining the portion of (formerly Regional District) sewer pipe that is used only by Rossland CARRIED unanimously. i) 2019 Community Resiliency Investment Program: a new provincial program designed to reduce the impact of wildfires on BC communities; it replaces the Strategic Wildfire Prevention Initiative, including FireSmart activities. Grants would be 100% government-funded – requiring no matching funds from the city. A motion to endorse the program and provide grant management for it CARRIED unanimously. j) Winter Carnival Bobsled Agreement 2019/2020: the draft Agreement makes the winter Carnival Society responsible for the event and for any liability arising from it, sets out specific tasks for the Society and requires the Society to purchase a minimum of $3,000,000 public liability insurance; and provides the use of Spokane Street and City Public Works personnel and equipment to construct the course. A motion to approve the agreement CARRIED unanimously. k) Water and Sewer Restructured Rate Model Proposal: Chief Financial Officer Elma Hamming recommended that Council rescind its motion, passed on July 4, 2018, to increase overall water rates by 13%, and that Council instead renew its direction to staff to revise the Water Rate Bylaw for 2019 to 2013, to include an “account administrative fee” to cover the annual subscription fee, and to raise the annual rate increase from 4% to 5%, with the additional 1% coming from consumption rates. She also recommended dividing the current sewer fee into two components, without changing the amount charged – one part for the sewer fund operation, and one for the Regional Sewer Utility. This will make it more evident to users what the charges are for. Motions for each recommendation CARRIED unanimously. a) Business Licence Amendment Bylaw No. 2327, 2018: A motion to give first and second readings to the bylaw, and to set a Public Hearing on it for December 10, 2018, CARRIED. The bylaw has been amended to ensure compliance and compatibility with new provincial regulations. b) Council Procedure Bylaw No. 2646, 2018: A motion to give the lengthy bylaw first, second and third readings CARRIED. It will ,also be open for discussion at a Public Hearing on December 10, 2018.
c) Fees and Charges Bylaw No. 2655, 2018: A motion to give the bylaw first, second and third readings CARRIED. The bylaw has been made more readable, and includes charges for seven services that were formerly free to users but cost the City staff time and, in some cases, use of large equipment. Other charges have been adjusted to cover the cost of services and application processing. d) East End Regionalized Sewer Utility Reserve Fund Bylaw No. 2683, 2018: A motion to give the bylaw first, second and third readings CARRIED. It establishes a reserve fund, dedicates an amount to be deposited into it, and sets out how it will be built up, and what it may be used for. e) 20 19 Annual Revenue Anticipation Bylaw No. 2684: A motion to give the bylaw first, second and third readings CARRIED. This bylaw is a formality required for the City’s banking services. Regional District of East Kootenay Regarding Request of Appointment to Ktunaxa Kinbasket Treaty Advisory Committee: Council declined to appoint anyone to the committee, noting that Rossland appears to be outside the territory subject to the claim although it was named as being affected. INFORMATION ITEMS: Council reviewed the Heritage Commission Minutes for September 24 and October 22. MEMBER REPORTS: Council members reported on meetings they have attended recently or will attend soon. The meeting then Recessed to an In-Camera session pursuant to section 90(1)(e) of the Community Charter: the acquisition, disposition or expropriation of land or improvements. And your reporter went out to don her boots with spikey traction devices, bundled up in a warm puffy coat, and walked home in a lovely swirl of snowflakes – hoping for drier snow at higher (but not much higher) elevations. And being grateful for a little home equipped with drapes that effectively block light from the nearby streetlight, which lights the driveway wonderfully.